What Tailgate Party doesn’t need a huge tray of hot wings? 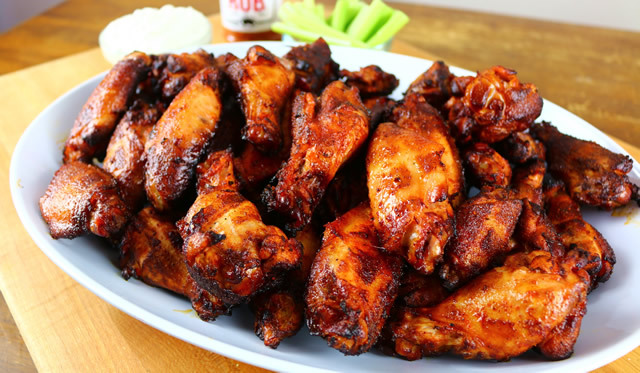 This recipe is always a crowd pleaser and it’s easy to make a ton of these wings for game day. We’re skipping the hot oil and firing up the smoker! 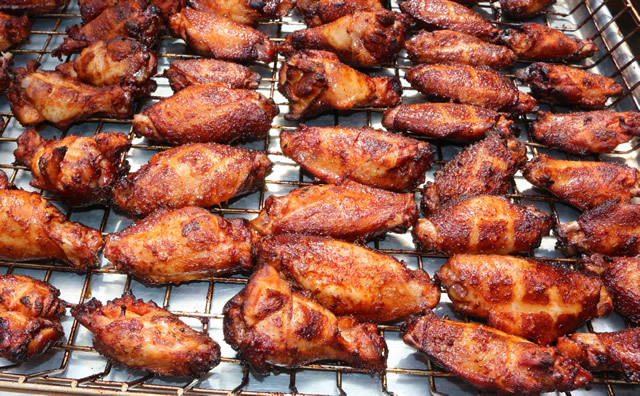 I’m using Party Wings for this recipe; these are frozen wings you can find at any grocery store. They typically come in a bag containing the 1st and 2nd wing portions (drummy and flat). They’ll need at least 24 hours to slow thaw in the fridge. I have thawed them in water in a pinch but it’s not recommended. Once the wings have thawed, they go into a large zip top bag. In a large mixing bowl add 2 cups of your favorite Hot Sauce, 1 bottle of Zesty Italian Dressing, ½ cup Soy Sauce, and ½ cup Worcestershire Sauce. Mix these ingredients and pour into the bag with the wings. Squeeze as much air out as possible and toss the wings around so the marinade covers everything. Place the bag of wings in a cooler on ice. It helps if you have a layer of ice on bottom and a large pan on top just in case the bag leaks. Let the wings marinate for at least 3-4 hours but overnight won’t hurt. The folks at Ole Hickory Pits sent me one of their new wing racks to try out; it makes cooking a load of wings simple. Just take the wings out of the marinade, let the excess marinade drip off, and arrange them on the rack. If you don’t have a rack that’s ok too, just lay them on a platter or flat pan. Season each side with a light dose of Killer Hog’s AP Rub then a light dust of Killer Hog’s The BBQ Rub. If you have a personal favorite go ahead and use it. I’m running these wings on my Ole Hickory Ace MM Smoker. Once the pit is up and running at 275⁰, it’s ready for the wings. Throw a chunk of Cherry and Hickory wood on the hot coals and place the wings in the cooker. You can use any smoker or grill, just maintain your temp in the 275 range for the entire cook. After the wings have smoked for 1 hour, it’s time to take a look at them. I want to see a reddish- caramelized color. Go ahead and flip the wings over at this stage and hit them with a little extra rub so they cook even. They’ll need another 30 minutes to an hour to finish cooking. If you’re not sure you can always stick them with a meat thermometer. The ThermoPop will give you a quick reading even in a small piece of meat like a wing. The Internal Temperature needs to hit 165 at least, but it won’t hurt to overshoot it a little bit. At this point the wings are done and ready to serve. You can toss them in any sauce you like. When cooking for a crowd, it’s always a good idea to have some choices. For these I’m sticking with a traditional smoked wing the only thing I’m adding is a touch of Killer Hog’s Hot Rub right on the platter. You’ll want plenty of Blue Cheese Dressing or Ranch (Chelle’s favorite), and I always cut up some celery or carrots to keep the doctors happy! Hope you give this recipe a try at your next football gathering. Mix all of the ingredients together in a bowl and refrigerate for 1 hour before serving. wow, that’s pretty awesome. being from upstate NY, I grew up on Buffalo Hot Wings. We never just got pizza – it’s always pizza n wings – so I can really appreciate what you have here and I would love to try that recipe to heat it up on a cold winter night.